Wow. That’s about all I can say at this point. It’s been an amazing week full of family and fun and lots of opportunities to practice right action and be mindful about what I’m doing. Wow. I’ve just returned from a great week in San Diego with my family. We spent Thanksgiving there and had an amazing time. We went to Legoland, Los Angeles where I met Stan Lee, Disneyland, the USS Midway, the Gas lamp District, the San Diego Zoo, the Air & Space Museum, the Old Globe theater to see How The Grinch Stole Christmas and hung out with family enjoying one another’s company. It really was a whirlwind of a week. Now, I’m home in the crisp winter air of Maine where you can see your breath and the frost has finally found a home on the ground. My ears haven’t handled the return flight too well and I’m dealing with quite a bit of pain from them and I think I’ve gotten bronchitis and I’ve lost my voice but I’m too happy to care. Suffering happens, I’m not going to make myself any better by moaning and being depressed about my state. That’s the clarity that I’ve gotten on this trip. One of my main concerns before I left was being able to eat well while I was gone. Except for the days I spent traveling, things were very easy for me. California makes it very easy to be a vegetarian. Everywhere we went to eat there was something vegetarian on the menu. The best thing was, it wasn’t something that sucked either. In California, having a good selection of vegetarian entrées is a necessity for most restaurants. I had the best vegetarian burger I’ve ever eaten at a place that really was more of a “how many things can we do with a cow?” kind of establishment. Even Thanksgiving dinner had some really good vegetarian options. My aunt made a curried lentil dish special for me and another family member who is also a vegetarian. She gave us the recipe while we were eating it and at the moment we both had a fork full ready to go into our mouths revealed that she uses two cans of chicken broth when making it! We both kind of looked at each other, shrugged, and popped it into our mouths. My aunt is not a vegetarian and made a mistake that many non-vegetarian cooks do by using something derived from meat and still thinking the dish was vegetarian because it didn’t have any visible chunks of flesh in it. Since neither of us is militant about it we embraced the thought behind it and enjoyed it anyway. We both had seconds on it and loved every bite. I was also able to exercise a lot while I was there. The hotel’s exercise center was just down the hall from our room and I was able to use the elliptical machine and the treadmill on three different mornings. The other days we spent a long time walking around. I used a pedometer on my phone to track how much walking we did at the zoo and by the end of the day we had clocked in over three miles of walking around. I don’t even want to think about how much walking we did at Disneyland yesterday. It had to be more than the zoo by at least a mile. I have a number of things that I will be writing about over the next few days but don’t have the clarity of mind to do it now. Any day where you see both the Pacific and the Atlantic oceans is a long day and I’m feeling it. Tomorrow morning we pick up my cats from the cat-sitter and we check on our hamster who is nearing the end of her life (that’s another blog entry altogether). I have pictures to clean up and publish and I’ll be writing a lot both here on the blog and on another project I’m working on. Spending the week away from home has renewed my enthusiasm for a writing project that I’ve been working on for almost a year but haven’t touched in the past few months since I was too busy doing other things. There’s nothing like a change of pace and perspective to really help you get your priorities in line. Now, I’m going to go get reacquainted with my zafu and then it’s time for bed. Tomorrow, I jet off to California to spend Thanksgiving with my family. We’ve been looking forward to this trip for a long time and my son is going nuts over the chance to go to Lego Land. I’ll try to update the blog from time to time so that I can track how I’m doing going through the biggest day of gluttony in the USA. On a personal note, I really need this vacation time. Work has been pretty stressful for me as I wind down a couple of projects and start up a new big one. I know that I’m too preoccupied with work when I wake up at 3:00 A.M. thinking about how to design screens to make data entry as efficient as possible. I hope to spend the next week just focusing on family and fun and do it all mindfully. It’ll be nice to exercise in a new location too. The pictures I’ve seen of our hotel’s gym look pretty nice. I’m sure I’ll find plenty of things to keep me busy each morning. Stay tuned for pictures starting (probably) on Friday. 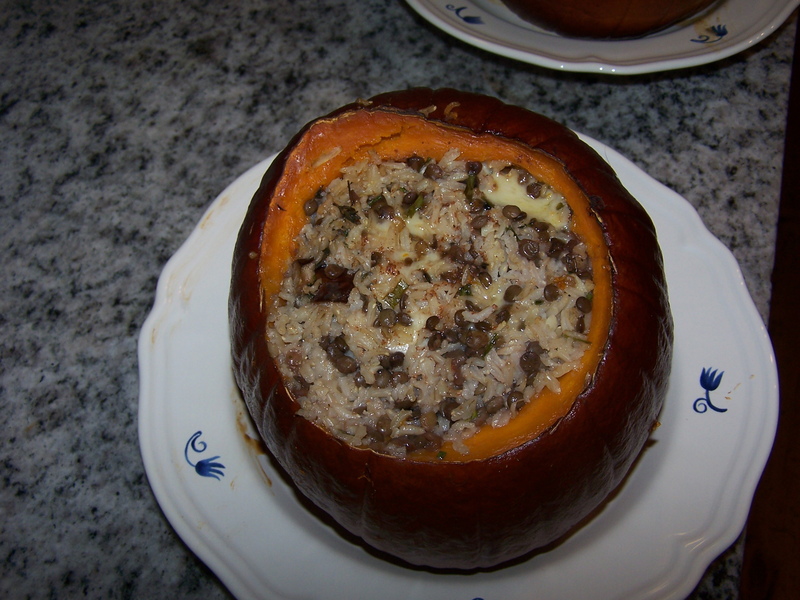 I heard a story on NPR the other night about a recipe called “Pumpkins Stuffed with Everything Good”. It caught my interest for a few minutes but I didn’t think much about it since it really did have a bit of that smarmy NPR edge to it that makes food and recipes out to be something they’re not. I’m not slamming NPR at all considering that it’s pretty much the only thing I listen to in the car if I’m not listening to music, it’s just that their food reporting always leaves a bad taste in my mouth. This morning, someone on Facebook linked to the story and I saw the picture that went along with it and was amazed at how beautiful the food looked. That’s when I decided I was going to give it a try. Tonight. On short notice. Yeah, I’m that kind of crazy. Besides, we were having a friend over for dinner and I wanted to make something unique and special: this certainly fit the bill. I just happened to have some beautiful pumpkins that we had gotten last month as a local farm that we support. They were the perfect size for individual servings. On my way home from work I stopped by Trader Joe’s and picked up what I needed to make this a great dish. I also picked up a few different cheeses and other foods to snack on while our guest was with us. There’s nothing like a fresh cheese plate to say “welcome to my home”. I had a delicious Stilton, a unique goat’s milk Gouda and a triple cream Brie that was rich and creamy to the extreme. But, enough about cheese! Let’s get on to the main course. My goal was to make something vegetarian, healthy and gluten free. This meant I was going to have to go off book for this recipe and fly blind. I was totally comfortable with that since it just makes the experience that much more fun for me. Yeah, I’m that kind of crazy. With those goals in mind, I cooked up some brown basmatti rice and some French green lentils for the main body of the stuffing. While they cooked, I enlisted my son to help me remove the seeds and the guts from inside each pumpkin. I saved the seeds for later and then prepared the rest of the filling. I cut up some Gruyère cheese into half-inch cubes and cut up some fresh eggplant into bite sized pieces (this is the third time I’ve had eggplant this week; that’s three times more than I have ever had it before: who knew?). These were followed by some chopped chives, fresh thyme and some roughly minced garlic. Last, I gave an onion a quick cut and sauted it until it began to carmalize. Once everything was prepared, I mixed it together well and then stuffed my pumpkins to the point of bursting. Once they were as full as I could get them, I took some almond milk and added freshly grated nutmeg to it. The milk/nutmeg mixture got poured into the pumpkin and filled up what little space there was with more yummy goodness. 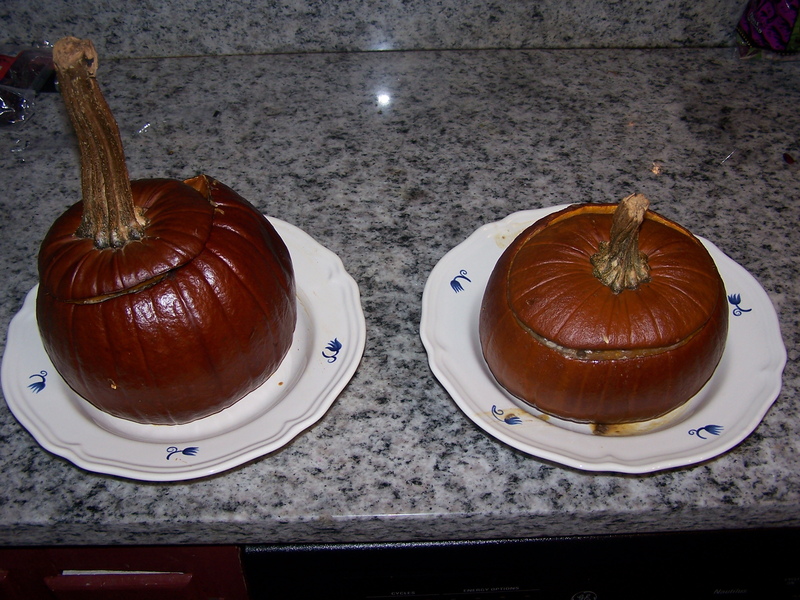 The pumpkins went onto a parchment paper lined baking sheet and into a 350 degree oven for 90 minutes. After the 90 minutes, I pulled the tops off to allow some of the liquid to cook off and let the top get crusty and delicious. The pumpkins stayed in the oven for another 30 minutes while they finished turning into something even more magnificent than a coach that will take you to the ball. While the pumpkins were cooking, I prepared a second meal for my wife and kids and got the cheese plate ready and prepped some IQF shrimp and got a small buffet going on a table in the kitchen so that our guest would be able to sit and eat some appetizers with my wife and kids while I was able to participate in the discussion from behind the stove. It worked out great. Everything came out at the same time and the pumpkins were perfect. The finished product is below. Isn't that cheesy and good? Yes, yes it is. I can’t begin to describe how wonderful these tasted. 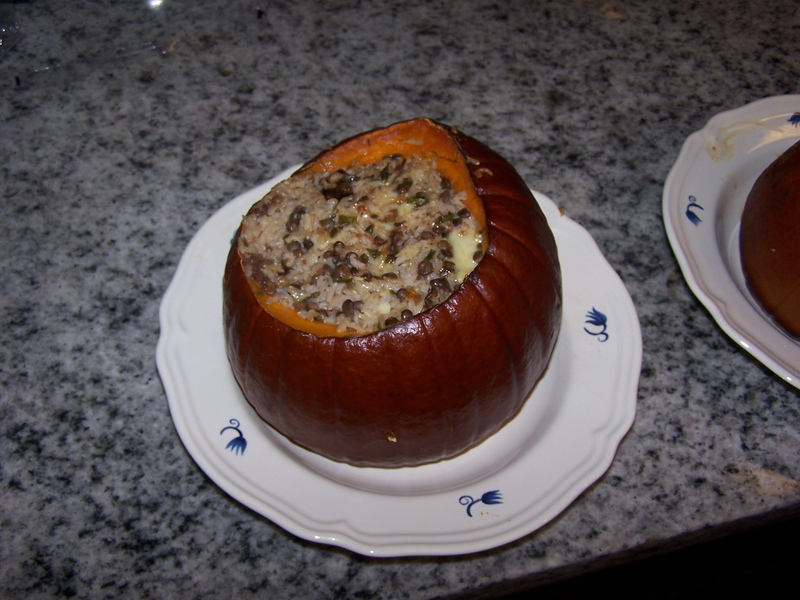 The pumpkin was tender and the flavor of it had soaked into the filling. The brown rice and green lentils held up wonderfully and made for a great way to get complete protein from the meal. The cheese had melted throughout the filling and every bite you took was gooey and yummy and warm. The eggplant was tender and had a great flavor to it and the texture was different enough from the other items that it added a great counterpoint to the other ingredients. This was one of the most unique things I’ve ever made and I think it’s a dish that we’ll remember for a long time to come. The great thing about it is that you can stuff it with pretty much anything you want and it will come out well. I was only able to eat about half of my pumpkin so I have a really good lunch to look forward to tomorrow. Right now, even though it’s been a few hours since I ate, I’m still stuffed. This dish was quite filling and really did make quite an impression sitting on the table. If you’re looking for something to make this Thanksgiving that will be different but still capture the feeling of the season well, you can’t go wrong with something like this. I wish that I still had more pumpkins left as I’d be making this again in a few weeks. On the advice of my doctor, I started taking Niacin to bring up my HDL (good) cholesterol. Apparently, when you lose a lot of weight and change your diet your good cholesterol drops just like the bad stuff does. Vitamin B3, or Niacin, is a good way to bring up your good cholesterol. I went to Whole Foods and got some No Flush slow release niacin. The bottle cost a little over $20 but I figured it was worth it. I’ve been taking it now since late September. The bottle finally ran out and I didn’t want to spend that much on a supplement again so I went to the pharmacy and found a slow release niacin for only $8. The reason you want to get a slow release, or no flush, niacin is that too much of it will cause your capillaries to enlarge and cause a lot more blood to flow very close to the skin and this causes it to become red, inflamed and painful. I knew this was a potential problem so I made it a point to slowly build up my intake over time. I eventually got up to 2000 mg per day so this is what I took when I got home with my new, cheaper, niacin. This was one of the bigger mistakes of my life. See, there’s a difference between one companies slow release niacin and another’s. This didn’t occur to me until about a half hour after I’d taken the four tablets of the new stuff. I first noticed a difference when my face started to feel a little hot. Then, my lips started to feel swollen. My son told me that my entire face looked red and “a little purple”. That’s when the tingling started. It felt as if my entire face had fallen asleep and was now having to wake up by tingling and burning and swelling. To say it was scary would be an understatement. Just as I began to really get concerned about this, the burning and tingling spread to my arms. In a panic, I lied down in bed and that’s when my wife helped me to figure out what was happening. I felt better when I realized it was a niacin flush and not something worse. However, I should have known that it can always get worse. As I lay in bed, the tingling, pain and burning quickly spread all over my body. It was absolute torture to go through this. The good thing is that it doesn’t last too long. The bad news is that before the flushing goes away, it starts to itch. At this point, I find myself stuck in the bed with pain, burning, tingling skin while itching like I’ve never itched before. I like to think that I have a semi-decent way with words but I can never express just how bad I felt. I proceeded to go through about three hours of some of the worst pain I’ve ever experienced except for a couple of kidney stones. Eventually, I ended up falling to sleep for a few hours but it took until early evening to start to feel normal. Even after I woke up I had chills and my lips felt swollen. It was quite unlike anything I’ve ever experienced before. Given the choice between physical suffering like this or mental suffering, I’ll take the mental stuff any day of the week. Instead of Sunday, today was Samsaraday! Except for this little mishap it’s been a pretty good weekend. We’re getting ready for snow to come soon and feeling winter roll in. Change is coming in a lot of ways over the next few weeks. The first change I’m making is going back to the $20 bottle of niacin. It’s worth every penny!